In the last three decades, records of tribosphenidan mammals from India, continental Africa, Madagascar and South America have challenged the notion of a strictly Laurasian distribution of the group during the Cretaceous. Here, we describe a lower premolar from the Late Cretaceous Adamantina Formation, São Paulo State, Brazil. It differs from all known fossil mammals, except for a putative eutherian from the same geologic unity and Deccanolestes hislopi, from the Maastrichtian of India. The incompleteness of the material precludes narrowing down its taxonomic attribution further than Tribosphenida, but it is larger than most coeval mammals and shows a thin layer of parallel crystallite enamel. The new taxon helps filling two major gaps in the fossil record: the paucity of Mesozoic mammals in more northern parts of South America and of tribosphenidans in the Cretaceous of that continent. 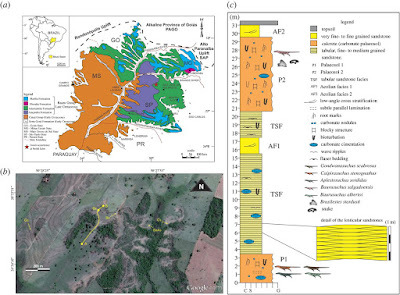 In addition, high-precision U-Pb geochronology provided a post-Turonian maximal age (≤87.8 Ma) for the type stratum, which is overlain by the dinosaur-bearing Marília Formation, constraining the age of the Adamantina Formation at the site to late Coniacian–late Maastrichtian. 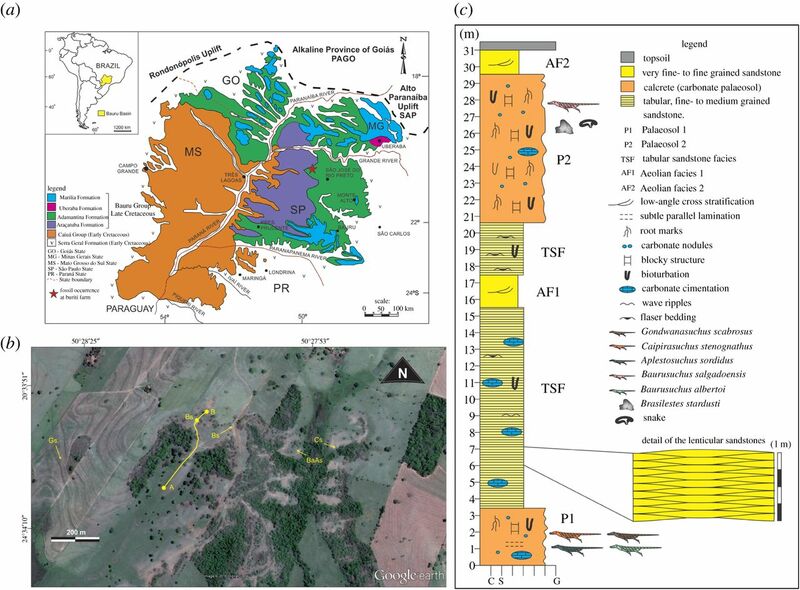 This represents the first radioisotopic age for the Bauru Group, a key stratigraphic unit for the study of Cretaceous tetrapods in Gondwana.